Buffalo chicken sandwiches are one of the most universally revered foods here in the States. Who can resist a giant, saucy spicy fried sandwich smothered in ranch dressing? Not me! Luckily, it is 2018 and we can make vegan versions of anything! Why eat chicken when you can make Vegan Buffalo Chickpea Sandwiches? These Vegan Buffalo Chickpea Sandwiches are perfect for a quick dinner or Game Day snack. I promise your Super Bowl party will be a much bigger hit with a plate of these on the table! And they couldn’t be easier to make. Chickpeas + Spices + Flour = VEGAN MAGIC! The method for these Vegan Buffalo Chickpea Sandwiches was inspired by one of my all-time favorite vegan cookbooks, Veganomicon. My husband has been dying for a vegan buffalo sandwich recipe, so when I found their simple recipe for chickpea cutlets, I knew I could make a killer buffalo sandwich with the chickpea/wheat gluten combo! If you’ve been following me for a while, you know how much I love a good aquafaba batter followed by a pan fry, as evidenced by my Baja Portobello “Fish” Tacos and my Vegan Southern Fried Chik’n and Waffles. These methods were the perfect compliment to the chickpea cutlet base to create the most delicious Vegan Buffalo Chickpea Sandwiches EVER. Hearty, saucy, and fool-proof- this recipe is so simple! Have these Vegan Buffalo Chickpea Sandwiches on the table under forty minutes! You can make them even faster if you batch out the dough ahead of time. It will keep tightly wrapped in the fridge for up to three days. 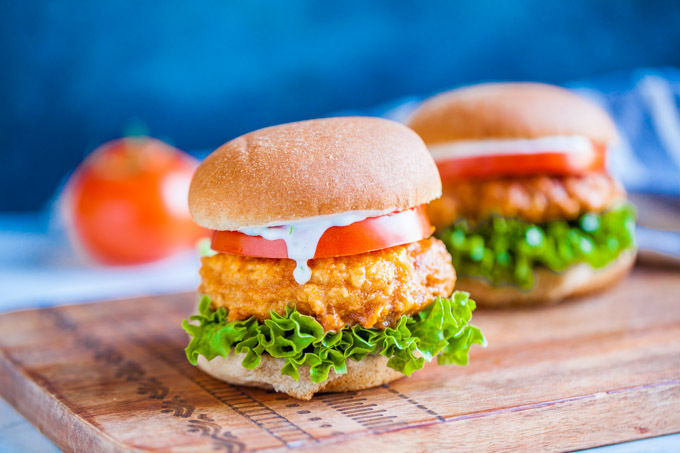 If you try these Vegan Buffalo Chickpea Sandwiches, please rate them in the comments below! We’d love to hear how yours turned out! While you’re at it, post of photo of your creations to Instagram with the tag #carrotsandflowers It always makes our day! To save this recipe for later, Pin the photo below! Don’t forget to follow us on Instagram and Pinterest for more exclusive content! Hearty, saucy vegan Buffalo Chickpea Sandwiches- the ULTIMATE plant-based comfort food. Simple ingredients + easy methods make this a perfect weeknight dinner you're going to crave! Drain and rinse the chickpeas, reserving the liquid (aquafaba) in a shallow bowl. Mash the chickpeas with 2 Tbsp olive oil until no whole chickpeas are left, but still leaving some chunky pieces. Add the bread crumbs, bouillon, paprika, garlic powder, thyme, sea salt, and lemon juice. Mix with a fork or your hands until just combined. Sprinkle in the gluten. Knead the dough with your hands until gluten strings form, about 2-3 minutes. Add more gluten 1 Tbsp at a time if the dough feels too wet and sticky. Add a small amount of water or olive oil if it's seems dry. Form the dough into patties using small handfuls of dough. Press the patty into a shape slightly larger than the size of your palm, about ½" thick. In a shallow bowl, whisk together the dredge ingredients. In a separate shallow bowl, prepare your buffalo sauce by combining the melted butter, hot sauce, vinegar, garlic powder, and optional cayenne. Whisk together until smooth. In a skillet on medium heat, pour enough olive oil to cover ⅓" of then pan, about ⅔ cup depending on the size of your skillet. Working quickly so the oil doesn't burn, coat the chickpea patties in the aquafaba, then dip them into the flour mixture. To keep your fingers from becoming too sticky, use a fork to transfer the patty from the aquafaba to the flour, then use a dry hand to sprinkle flour and coat the patty. Transfer the battered chickpea patties to the pan with a fork. Working in batches, fry each patty until golden brown, about 3-4 minutes on both sides. When finished, transfer the fried patties to a plate lined with kitchen towels to drain the oil. Give the buffalo sauce a good whisk in case it separated, then lightly coat the chickpea patties in sauce. Serve immediately on lightly toasted vegan buns with lettuce, tomato, and vegan ranch. The patties tend to crisp up more on the outside than the middle. To make the middle crispier, make a finger sized hole in the patty, similar to a donut, then batter and fry them as directed. This will help the middle get crunchy. You can also crisp up the patties by frying them for 2 minutes on each side, then baking them at 350 F for about 20 minutes. Made these tonight and they were great! I have tried several times to make wheat gluten meats and have not been a fan of any of them, but these were tasty. I love how crispy crunchy they are on the outside,and the flavor is great. I did have to use a few extra tablespoons of liquid to get dough to form. It was very crumbly without the added liquid. Maybe my lemon wasn’t as big or juicy as what you used? Also, you should edit in the the dredge ingredients to your ingredient list. The inside of my patties seemed a bit soft/raw? Perhaps I made them too thick? They were still great, but next time I will try making a thinner patty. Thank you for a great recipe! Thank you so much for the feedback Lauren! I’m so glad you enjoyed the recipe. I updated it to include the dredge ingredients, thanks for catching that! I also changed the directions to make the patties 1/2″ instead of 1/2″-3/4″. Hope that solves it! This recipe is BOMB! Such a hit every time. Thank you! I’m not one to comment on recipes, but I had to share! I’m a mom of three boys. They devoured these. Devoured. I had to stop one of them and tell him he isn’t a chickmunk who stores food in his cheeks and it isn’t a race. This is only my second experience with gluten and I’m so glad I didn’t close my mind after last time. These have perfect flavor and crunch. They really mimick (from what I remember) a great chicken buffalo burger. I’m definitely making these again!! Thanks for the amazing recipe! Can the patties be made ahead of time? Any suggestions on how to bake them instead of frying? Would I skip the aquafaba & dredge and put directly in the oven? What temp and how long? Thanks!! I don’t usually post either but these were some of the best sandwiches we’ve had. They ended up a little thick but that was my fault in the making of the patties. The flavor was wonderful. The texture was just right. I used peanut oil to fry because I didn’t have enough olive oil. They crisped up perfectly. If you’re one of those people who read the comments to decide whether or not to make a recipe, definitely give this one a try. How can I make these gluten free? I made a big batch of these A couple of meal prep weeks ago and put them in the freezer. They freeze and thaw wonderfully. I made several patties and then made some nugget shaped ones. They are perfect. Hi. Can you please tell what texture I should expect from these? I made them last night (and my family enjoyed them) but I think I didn’t get them quite right – the texture was so much like melted cheese that one son opened his up to confirm that it wasn’t a block of cheese. I was expecting something firmer and chewier. I did add a fair bit of water to get the mixture so I could knead it – it was like a firm bread dough. Did I add too much water? I made them as thin as they could be and still hold together. Thanks.